Resistance training for activity limitations in older adults with skeletal muscle function deficits: systematic review. Human aging results in a variety of changes to skeletal muscle. Sarcopenia is the age-associated loss of muscle mass and is one of the main contributors to musculoskeletal impairments in the elderly. Previous research has demonstrated that resistance training can attenuate skeletal muscle function deficits in older adults, however few articles have focused on the effects of resistance training on functional mobility. The purpose of this systematic review was to 1) present the current state of literature regarding the effects of resistance training on functional mobility outcomes for older adults with skeletal muscle function deficits and 2) provide clinicians with practical guidelines that can be used with seniors during resistance training, or to encourage exercise. The authors set forth evidence that resistance training can attenuate age-related changes in functional mobility, including improvements in gait speed, static and dynamic balance, and fall risk reduction. 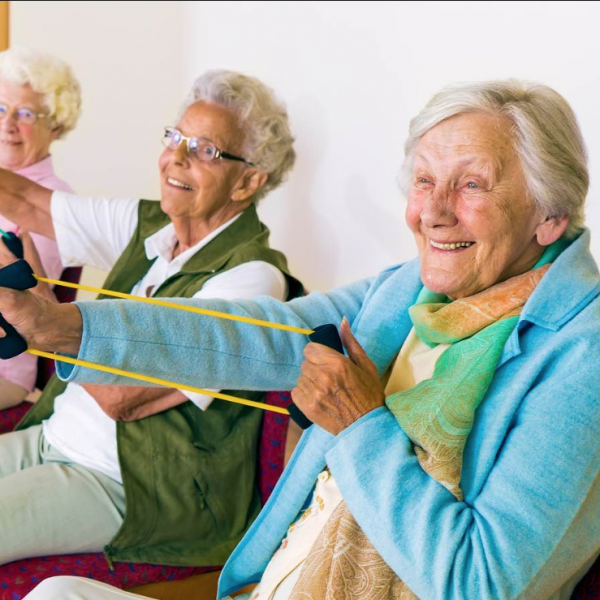 Older adults should be encouraged to participate in progressive resistance training activities, and should be admonished to move along a continuum of exercise from immobility, toward the recommended daily amounts of activity. Resistance training for activity limitations in older adults with skeletal muscle function deficits: a systematic review. Papa EV, Dong X, Hassan M. Clin Interv Aging. 2017 Jun 13;12:955-961. eCollection 2017. Review.